Zaleha Everlynn: WHY GLUCOS CUT? 1. “GOOD SCIENTIFIC EVIDENCE HERBS"
Glucos Cut contains “good scientific evidence” herbs that concluded by the U.S. National Library of Medicine (NLM) and the National Institutes of Health (NIH). Green tea contains high amount of EGCG which has the ability to stimulate metabolism and fat burning. 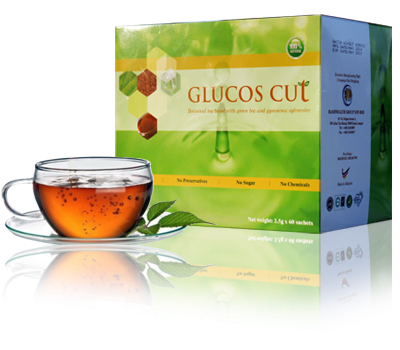 Glucos Cut has taken the benefits of Green Tea to the next level by infusing additional herbs that increase sugar metabolism and control sugar cravings. You may notice weight loss and body slim down when drink Glucos Cut regularly. No worries to be taken for longer periods. Glucos Cutsweetened with NATURAL sweetener, stevia. Beside, according to some researches, stevia are beneficial in regulating blood sugar levels and improving pancreas function too.